(April 7, 2016) – CableMod – a leader in internal PC beautification – gives users the tools to realize their perfect PC vision. We began with offering a wide variety of cable colors, and support for the industry’s leading PSUs. 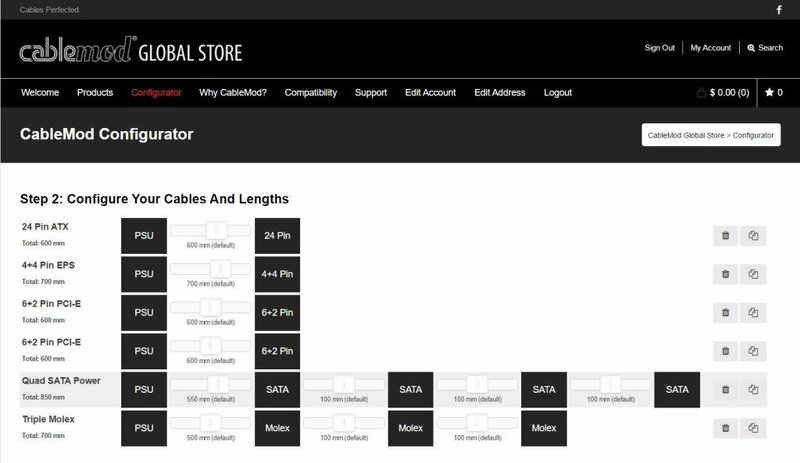 Today, CableMod is proud to announce the latest revolution in custom PC cabling – the CableMod Configurator. 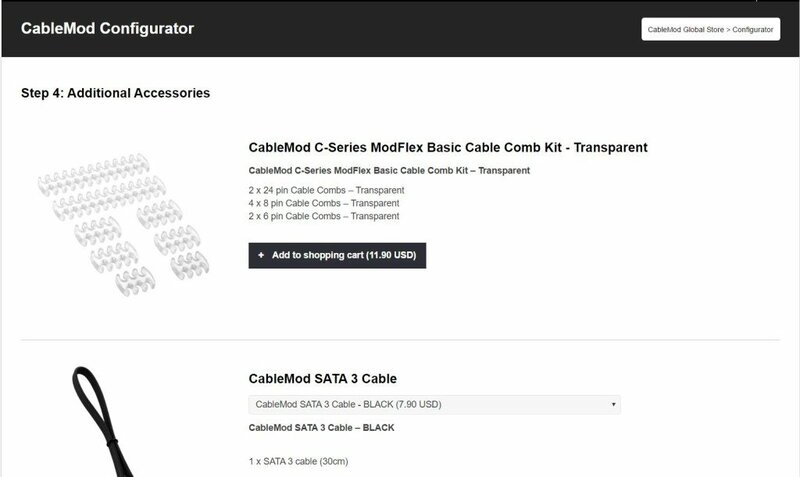 With the CableMod Configurator, users will be able to customize their very own PC cables quickly and easily, allowing them to tailor cables allowing them to tailor cables for over 150 PSU models. From there, users will be able to choose exactly the cables they need for their build, and furthermore, define the lengths for each cable using the simple sliders. The CableMod Configurator makes it easy by only displaying cables that are compatible with the PSU the user has selected. After adding the cables they need, the real fun begins. 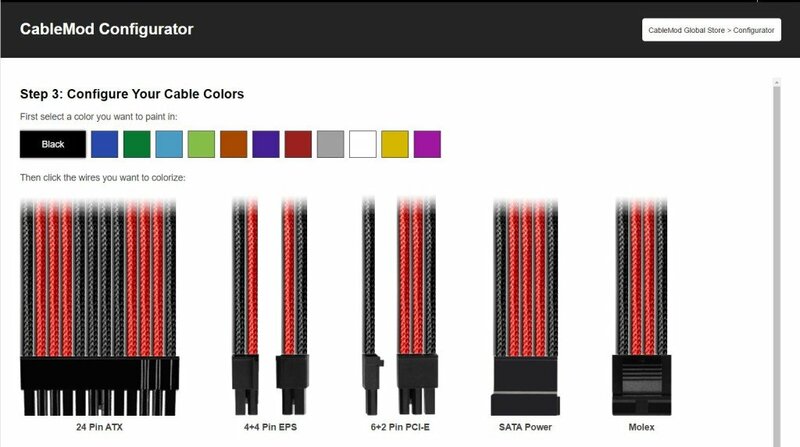 Users will then be able to customize the colors on each cable type, selecting from a wide variety of CableMod ModFlex™ sleeving colors. Simply select the desired color, and color in each wire – it’s really that easy! After defining their cable kit, users can also choose from a number of additional cables and accessories, including cable combs, additional stock cables, as well as CableMod WideBeam LED Strips for added customization possibilities. Once the order is submitted, CableMod goes to work to make the users creation a reality. Users can expect an estimated wait time of 1-2 weeks or a full set of customized cables. Simple to use and made to order – the CableMod Configurator represents next-level PC customization. I would like to run a dual power supply on the bottom of my 900D, two Corsair AX860i units. Other companies offer a jumper cable to the second 24 pin to allow both power supplies to be operated from a single power switch/operating system shutdown. Do you offer such a cable? Could a jumper be created so that it is attached to the 24 pin cable as a single unit? Hi Kyle! Please send your request to us at support@cablemod.com and we’ll see how to help! Hi! is the 24 pin atx cable 20+4 pin? do you offer shipping to the united states on custom configured cables. We use 18AWG for our cables. Happy ordering! Fantactic, thank you for the quick response. Do your cables also support the EVGA 650 GQ 80+ GOLD? Not currently, but send your request to us here and we will see what we can do! Hi Davide – our configurator ships worldwide! I’ve been looking at your configurator for my RM1000i, and I recently bought a regular sleeved cable kit from Corsair, but apparently my PSU uses a Type4, which is a 18+10 24pin cable, not sure how 18+10=24 but anywho, it isn’t clearly shown in your configurator that this is the case for these 24pins cables are Type4, can you confirm ? Hi Alex! Our C-Series RMi/RMx cables are indeed Type 4. Hope that helps! What is the ETA on orders to USA? I placed an order on May 5th and still no update. Hi Phil – orders from our Configurator generally ship in 1-2 weeks, depending on the orders in the queue. Please contact our support team and we’ll get to the bottom of this for you! I looked at the configurator, and at the part where you color the cables it only lets you color one side of it. What if I want to have a different color at the top and the bottom of the cable? How can I do that? Hi there – we don’t currently have that functionality. Sorry about that! Are the EVGA 1000w GQ Cables only compatible through the Configurator? Hi – Yes, EVGA GQ Series cables are currently only available through the Configurator. Are extensions compatible with any PSU? Such as a Thermaltake one? Hi Joey! Yes, extensions are compatible with all PSUs. Happy shopping! Leider koennen wir aktuell nur Verlaengerungen fuer Chieftec anbieten – “Custom Extensions” oder “Extensions” wuerde passen. I need to know if in the configurator if the connection clips are facing down or up. I’m going to be using the PCIe connectors to chain together a theme, but I need to know which way the clip is. It appears the clip is underneath the connector in the image, but I need to verify before I design. This could be something that is clarified in the builder for people who have double plugs and want to theme them together! Also, the 6 and 8 pin PCIe, does this function exactly the same as a regular 6+2 pin, but for the 6 pin it’s without the extra two pins, and for the 8 pin its just a solid connector or, is it a different style connection for a different purpose? What I’m trying to do is really clean up my case, and I have a double ended 6+2 I have chained into my GTX 1080 for a 6 pin port and a 8 pin port, but it looks like crap. Can I use a 6 pin PCIe extension and a 8 pin PCIe extension on my build, or do I need to purchase two 6+2 pins? Hi Steven – you are correct. The clips are facing down in the Configurator, and will be made like that when you order. As for the 6+2 pin cable, it is exactly the same as an 8-pin PCI-e cable, but only with a different connector (6+2 in this case). The 8-pin PCI-e cable just has a solid 8-pin connector. For the cleanest setup, choose the 6-pin extension and the 8-pin extension. Much appreciated. I did make note of this in my order, I just wanted to verify. Do you/can you make 16 and 14 pin cable combs? I’m sure people would appreciate these for 6+8 and 8+8 GPUs. We currently don’t make 14 and 16 pin combs, but will pass your suggestion to our product department! Hey, I’m just saying, if it does end up taking can I get a complementary set of 14s? This could be responded to in private. But, in all seriousness, I hope that does end up taking off. One of your competitors has them already. If no to the above can I get a notification if they do end up selling I’d like some for my 1080ti I’m getting. Wish you guys made cables compatible with Thermaltake psus. Hi Nick – our PM department is working with Thermaltake to bring these cables to the configurator. Stay tuned! I second Nick’s comment. Thermaltake cables are wretched looking and there seems to be no alternative. When configuring an 8+6 pin Pcie cable I noticed I can set the length of the 8 pin up to 900m and the 6 pin only to 250mm. Is this length on the 6 pin how far down it is split off from the 8 pin or is it split off of the 8 pin connector like factory PSU cables would be? I ask because I wil buy an 8 pin pcie and a 6 pin pcie instead of an 8+6 if this is the case. Hi Zach – The length of the 6 pin is the distance between it and the 8-pin PCI-e connector, just like the factory PSU cables. In this case, getting an 8-pin PCI-e cable and a 6-pin PCI-e cable might look a bit cleaner. Thank you very much for the help. I look forward to using your product! I was trying to use the configurator but the continue to next step button on page one isn’t working. Hi Nathan – we’ve encountered a bug on the website and are looking into it. Thanks for the heads up! Despite international shipping, and me as a EU costumer. If i configure some cables, do they will be shipped within EU borders ex(DE), or outside ex(USA)? Hi Tiago – cables from our configurator are shipped from Hong Kong, while all products from our EU store are shipped from Germany. If you have any concerns, please contact our support team for help! I have a Thermaltake tough power 1250. are you able to make custom cables for this power supply. Is it possible to order an 24 pin ATX cable for the Corsair SF450 with 150mm? It’s for the Dan Case A4 and the current 250mm minimum is still way too long. I’ve been wanting custom sleeved cables for my Thermaltake power supply, is there any chance that Thermaltake will be added to the list? Hi, so all the products from cablemod shipped from Hong Kong? If so is it possible to pick up the products instead of having it shipped to us? I am from Hong Konger and saw the that i think the products from the intl warehouse shipped from Hong Kong. Hi Jeong – actually the products are shipped from China. Often they go from China to our forwarder in HK before being shipped overseas. Unfortunately, it won’t be possible to pick up the products. If I wanted to get power cables (not extensions) for my Ultra – X4 Special Edition 1000W 80+ Bronze Certified Fully-Modular ATX Power Supply would this be possible? Ohh, thank you! I submitted my question there. My 24 pin cable I ordered doesn’t fit my power supply, it splits to to cables for the psu side like the stock one does, but only one of the plugs matches up on the psu side. I did select my power supply, not a different one. I’d rather not buy a new cable, or power supply to use this one, so what do I need to do to get the right cable? Paypal isn’t letting me pay for my cables at all even if I’m using a credit card, It says “declined, use another one” or just nothing at all. I’ve checked my account three times, I have the funds. Any chance you guys will add purple to your available colors? I would love to get a set for a thermaltake psu, something you also dont seem to support. Is a single 6+2 pin PCIe going to be able to power a 1080 Ti FTW3? Or should I run two separate PCIe cables to the card? Hi Dylan – you’re going to want to populate all of the power connectors on your graphics card. Technically, you can either use a dual 6+2 cable, or two separate single 6+2 cables to accomplish this. If you’ve got enough cables, we suggest using separate PCI-e cables.